"Except for when material, equipment, services or labor is furnished at the request of the owner, a person furnishing any materials, equipment, services or labor for which a lien may be perfected, must give a notice of right to a lien to the owner of the site." O.R.S. 87.021(1). In Oregon, this means that contractors must send a property owner a preliminary notice if they ever intend on later filing of a mechanic's lien. Even if they don't anticipate needing a lien, it's generally good practice to send out such notices. The notice of right to a lien may be given at any time during the work, but the notice only protects the right to perfect a lien for materials, equipment and labor or services provided after a date which is eight days, not including Saturdays, Sundays and other holidays, before the notice is delivered or mailed. Id. The Notice includes the following information: (1) name and address of the lien claimant, (2) name and address of the property owner, (3) description of services, materials, or equipment furnished, (4) customer's name, and (5) the address where items were furnished. O.R.S. 87.023. Send the Notice by registered or certified mail with a return receipt requested, to ensure there are no issues of whether the proper party ever received it. This article is provided for informational purposes only and should not be relied upon a substitute for the advice of an attorney. 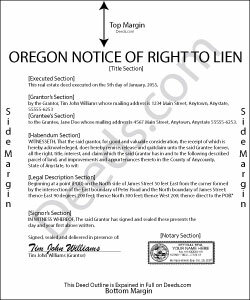 Please consult an Oregon attorney with any questions about preliminary notices or any other issue related to liens.